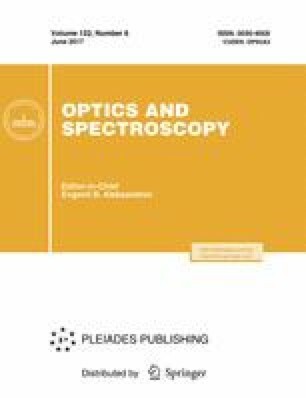 Optical characteristics of polymerization products under variable degrees of neutralization of acrylic acid (AA) and cross-linking agent and at a fixed content of redox components have been studied by IR spectroscopy of frustrated total internal reflection and THz spectroscopy. The results of the analysis show that absorption of IR radiation and dispersion of THz radiation for the samples under study depend on the degree of AA neutralization, which predetermines the mechanism of structure formation of hydrogels, refractive index, and degree of their limited swelling. It is found that the dependences of the refractive index of dry compact hydrogels and the degree of limited swelling of ground polymer samples on the content of neutralizing agent in solutions of the reaction systems have a symbatic character. Original Russian Text © I.V. Gredyukhina, L.V. Plotnikova, N.S. Balbekin, M.S. Kulya, N.V. Petrov, A.P. Nechiporenko, M.V. Uspenskaya, 2017, published in Optika i Spektroskopiya, 2017, Vol. 122, No. 6, pp. 912–914.